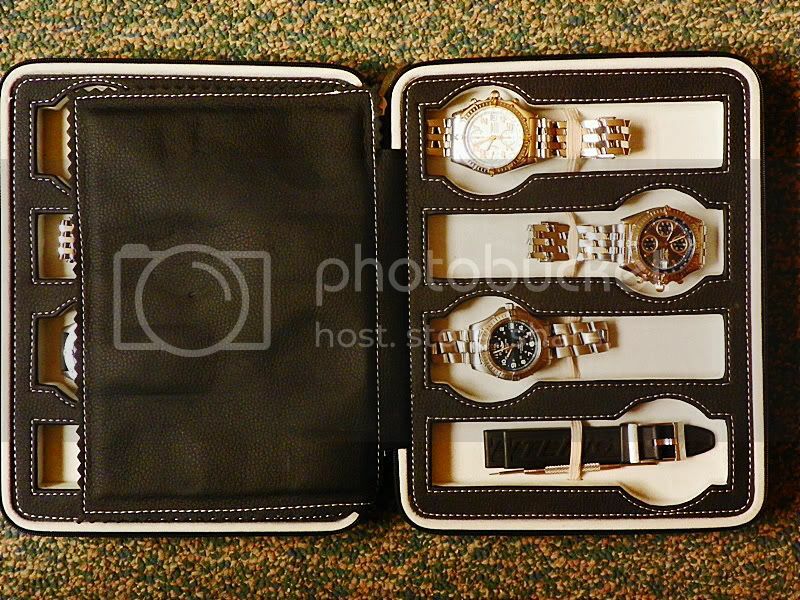 Just wondering if anyone else out there has a good travel case they use if they are transporting multiple watches or ever have need to not wear their Breitling publicly, like say on an African mini-bus. I use this type of travel case and it has worked very well for me for storing my watches and traveling between Iraq and the US. One note however; when traveling with multiple Luxury Watches, one should have copies of either receipts, insurance policy, or appraisals which proves that they were bought in your home country in order to pass through Customs without having to pay Duty. exactly what i am looking for - what company made it, or is it custom? i am looking one just to hold a single watch. I got this a couple years back, but I got it from an Ebay Store called The Watch Boys. I looked at their store and I do not see an 8 watch version listed, however they do have 4's and 2's in this style in in various leatherette choices. They also have a 1 watch travel case that is totally different in design as this model. 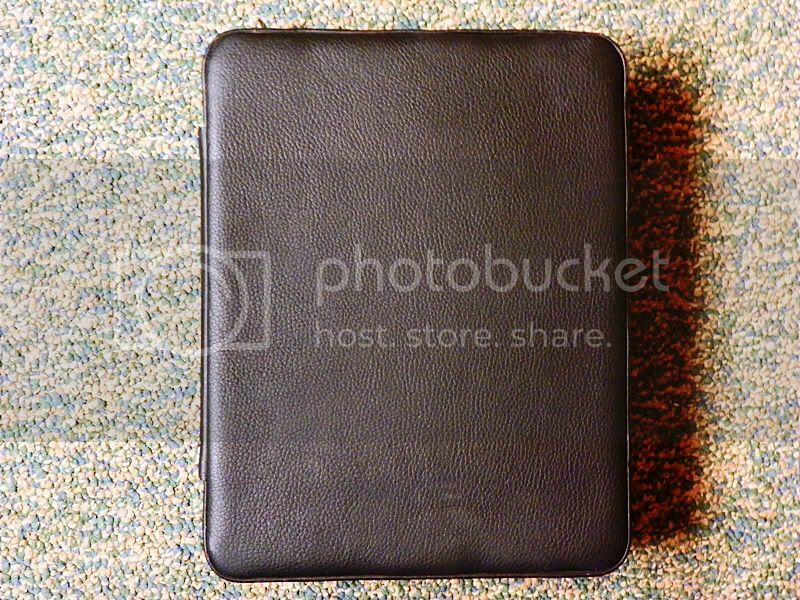 Also found a dual watch travel case at http://www.dinodirect.com/watch-box-pu-leather-travel-portable/AFFID-11.html?DinoDirect that may work for you. 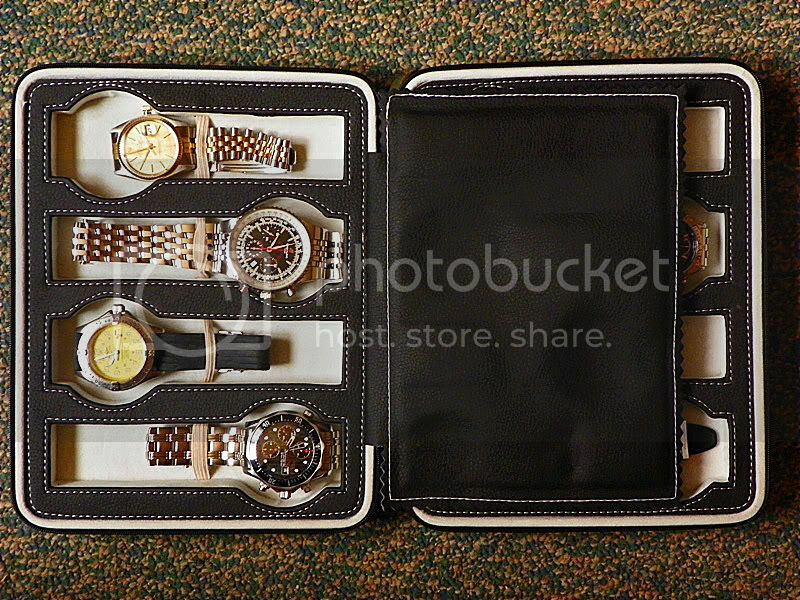 I did find the exact same 8 watch travel case at an Ebay store called Timely Buys as well. Skymall.com also has a one watch travel case available that is similar to the one below. Hope that helps you sir. If you just want single watch capacity the one that Breitling send a serviced watch back in works for me. Don't your case backs get scratched by laying your bracelet watches like that? 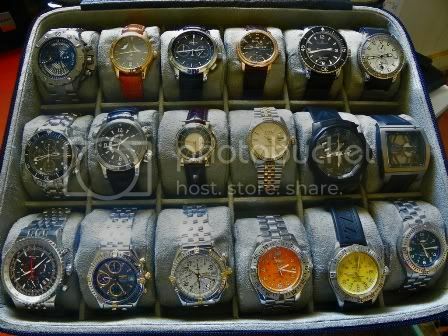 I prefer to put mine around a pillow-like travel case -- like the one that comes with the breitling boxes. I wish breitling sold them separately. Pete, I've not noticed any adverse effects on the case backs in the least bit. I agree a pillow would be ideal, but it would make for a much larger traveling case and not practical in my case. Traveling between here (Iraq) and home is baggage intensive enough already so I try to consolidate where I can. You can always lay a tissue between the case back and the bracelet. One note however; when traveling with multiple Luxury Watches, one should have copies of either receipts, insurance policy, or appraisals which proves that they were bought in your home country in order to pass through Customs without having to pay Duty. Interesting. Not something that I have done but only in the last year have I taken multiple watches with me. There are a few I have that I bought 2nd hand via forums so I do not have receipts for those. How would they be treated by customs? Not sure how it works in the UK, but I read up on it for the US and those were the suggestions they presented. I would imagine it would be close to the same in the UK if it came down to questioning you upon entry. You could get appraisals or an insurance policy that has them listed which would back up your claim that they were personal belongings that you were traveling with and not purchased abroad. If I'm travelling with watches I bought on eBay,I keep the the transaction stored on my iphone,other than that,I take photo's shot in my home environment. Travel rolls are really nice. I have two that can carry two watches each. Compact, soft inside. Holy old threads, Batman! An 8 year resurrection!